Once upon a time, and a good many years before you, I or anyone can remember, the Snowdrop flower did not bloom at the far edge of the winter, but in the summertime. Its name then was not ‘Snowdrop’ — a foolish name, for any observant person will tell you that snow does not come in drops, like rain or ink, but in tiny six-sided flakes. In those far off days, the Snowdrop was called the Milk Flower and it bloomed in June and into early July. In the rich city of Vienna, there was a good craftsman who made fine jewellery for those who could afford his wares. He made splendid necklaces of rubies set in links of gold; he made sparkling tiaras and diamond rings, filigree bracelets, silver combs for the hair; he made brooches and clasps and lockets. And he made earrings. It was his earrings that caught the eye of the Empress. They were a new style, with long, fat pearls that dangled from the ear and moved enticingly against the wearer’s neck. The Empress saw them, admired them, and ordered a selection to be taken to the palace for her to try. The jeweller (an astute man) made her a present of his finest pair. Soon the new style of earring was all the rage among the ladies of the Imperial Court. Someone named the earrings ‘Snowdrops’ — ‘Schneetropfen’ in the German language. No matter that snow never falls in drops: they were white, they were drop-shaped, and no lady of taste would wear ‘milk-drops’ dangling from her ears. Besides, it was mid winter, when one thinks of snow in Austria and Hungary. One thinks of snow, and longs for summer and warm weather. When summer came, the Court went into the country to live in their summer villas and mansions. Resplendent in their best finery, the grand folk rode and hunted and held picnic parties in the meadows. At the edge of the woods, the fairies watched and took notes: the widths of the lace collars, the latest cut of the riding coats, the new styles of petticoat, everything. For if there is one thing a fairy hates to be, it is to be out of fashion. At midsummer the fairies have their great feast. Every fairy of quality has to look his or her best for the ball. So spiderwebs are hunted down and the new collars cut from them, gossamer and thistledown are woven into light coats and gowns that rival anything seen in human society. Elven shoemakers turn snakeskins into the supplest of dancing slippers. Fairies do not have pearls and gold and other gems for jewellery. They can make fairy gold, but fairy gold is mostly moonbeams and old leaves, and fools only mortal eyes. The fairies adorn themselves with fresh flowers instead of jewels, and when the wearer is a light, delicate fairy rather than a powdered and rouged lady of the court, the beauty of the flowers enhances rather than eclipses the face that they frame. And for those all-important Schneetropfen earrings, what could be more appropriate than the little Milk Flowers, already in bloom in the woods? Here then were the fairies, ready for their midsummer revels. What revels they held that year! Perhaps it was the musicians, perhaps the flower-dew cordial, perhaps it was just something in the air, but the fairies could not stop dancing. They danced from dusk until sun up, and being still eager for more they continued to dance until it was full day. The farmer’s lads fetching the cows for milking saw them dancing. The country girls out to gather potherbs saw them dancing. The children sent to keep the crows from the crops saw them dancing. Even the rich folk, who always rose late and did not leave their mansions until the sun was high in the sky, even they saw the fairies dancing. The male courtiers were entranced, and stood watching alongside the villagers. The women were less impressed. They saw their fine clothes and jewels aped in now-ragged cobwebs and swiftly-fading blooms. They might have laughed at the fairies home-made fashions, but they observed how much more elegant a tatter of thistledown looked on a fairy than their own ballgowns on their own heavier figures, and those earrings…. Oh those earrings! No gold and pearl confections had such charm as the little white Milk Flowers swaying against perfect fairy skin with every turn of the dance. The Empress and her women left the men staring at their elven rivals. They withdrew to the parlour of a convenient mansion, and there they plotted. From now on, they announced, Snowdrop earrings were not fashionable at court. They would give their pairs to their servants and to their minor relatives — for nothing puts a style out of fashion so quickly as seeing it worn by common people. By late afternoon the fairy dancers had worn through their slippers and the ball was declared to be over. The human men eventually came back home, many of them clutching scraps of gossamer and snakeskin and discarded Milk Flower heads. Life went on. The parties and hunts and picnics continued; but there was restlessness in the air. The men spent much time wandering alone in the meadows at dusk, and the women were greatly relieved when the summer mansions were at last shut up and the Court returned to the city. Thus the Milk Flower acquired the name we know it by today. But it was still a flower of summertime, and it might well have remained such but for the ill will of the women of the Empress’s Court. 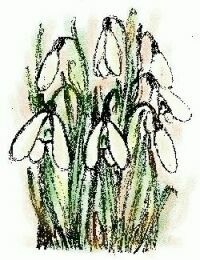 For they regretted having given away their Snowdrop earrings. Well, they said, if we cannot wear ours, then neither shall those impudent fairies wear theirs. Fairies have magic, as everyone knows, but human women have their own magic when they choose to make use of it. It is an old magic and a powerful one, it comes from the earth and the moon and the seasons and the ebb and flow of power in the blood. It is fuelled by great emotions — by love and hope and human-kindness, but it can equally be fuelled by hate and jealous ill will. In a secret room in Vienna, a group of women made a magic to deprive the fairies of their Milk Flower earrings. What it would do, they were not certain — such magic finds its own way of working once it is set in motion. And although they felt the evil power of their spell sweep through them and out into the world, they saw no sudden change. The next year the Snowdrops were out in as much profusion as ever; they even bloomed a little early. And the next year earlier, and the next…. In just a few years they were blooming in May and hardly any were still to be found by midsummer. Before the women who had worked the spell had grown too old to dance, the flowers were keeping company with Primroses, and still flowering a little earlier every year. The Court’s visits to the countryside were unremarkable again; the men might go looking for fairies at midsummer, but they were not to be found. There was also a change in the flower itself, had the Court ladies ever looked very closely at it. The magic had marked every inner petal with a tiny frown, the shape of a down-turned green mouth, a sign of their deep jealousy and hatred. Time passed, generations passed, the story was forgotten. The new name of the flower remained. (It keeps its old name in the botanists’ Latin version — ‘Galanthus’ — the Milk Flower — and ‘Nivalis’ for snow.) But in the woodland in the early, early spring, when the nights are still dark and cold and long, and the Snowdrops are in bloom, if you wait patiently and quietly after the sun goes down, you may see the fairies come to dance. They dance very privately now, they prefer to keep away from mortal eyes. They still dance at midsummer; but at the far edge of the winter they dance their first dance of the year, dressed in green and white and silver-grey, with the Milk Flowers swaying from their ears, and clustered like snowdrifts around their small, light feet.